Keeping the Pounds Off! : Twisted Goats Invade Florida: TGIF! Twisted Goats Invade Florida: TGIF! When I wrote my post There's Gold in Fridays I received several comments with other TGIF ideas. I am going to use them all, one Friday at a time. 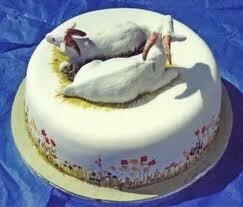 Today is Twisted Goats Invade Florida day, courtesy of a comment by KLC - Karen Anderson. They say March comes in like a lion. I say it comes in like an attack of twisted goats. 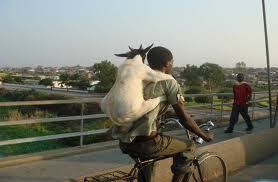 Here we see a goat attacking an unsuspecting Florida student as he bikes to school this morning. In Florida, where everyone worships a corporate Mouse, this attack is not picked up by the press. Anything that might stop you from coming to the land of Mickey and leaving your money behind will not make it to our newspapers. God forbid it gets picked up by the wire services and causes some family in far off Duluth to change their vacation plans. Florida is well known for the topical and sub-tropical birds that grace our skies and trees. There are many aviaries for people to come and see the special plumage of rare and exciting bird species. Peacocks actually take to the cypress trees all the time. (HINT: never stand or rest under a cypress tree if you hear the call of peacocks. They will dump on you like you have never been pooped on before!) Now, with the invasion of twisted goats in Florida, the peacocks have been replaced by roosting twisted goats in the trees. What this will mean for the rest of the bird species still remains to be seen. Obviously goats and peacocks cannot roost together. For now, the peacocks have moved on to their Florida corporate headquarters in the NBC news studio in downtown Orlando. 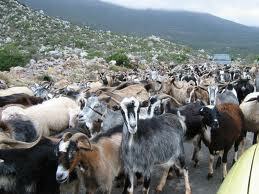 Thousands of Twisted Goats continue to pour across the Florida boarders. There are unconfirmed reports that twisted goats are also wading ashore on Miami Beach, Vero Beach, St Augustine and Sand Key. Twitter users have tweeted goats were seen disembarking from cruise ships in Port Everglades in Ft Lauderdale and Cape Canaveral, Cocoa Beach. The Salvador Dali Museum in Tampa/St Pete says goats are in the museum - but that they appear to be better behaved than most of the guests who visit there during spring break. What meat is consumed by more people in the world, in greater quantities than beef, chicken or pork. Yes, it is GOAT. 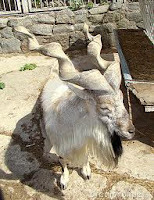 While it is not usually the protein of choice here in the USA, goat is a staple in the diets of people in many African, Asian and island nations. (I am NOT making that up, people - look it up for yourself). It is believed that this Invasion of Twisted Goats into Florida is actually a massive immigration of foreign born goats in an attempt by the various goat species to find a state where they can rule, reside and rest without fear of being eaten. Have you seen the old goats currently ruining, I mean running the government in Tallahassee? Twisted Goats could certainly be an improvement over the crook, thief, felon, carpetbagger, guy who is governor now. Perhaps we might encourage the Grand King of the Twisted Goat Invasion to take residence in Tallahassee and tip his horns into the well of garbage that sit in the State House? I would be willing to bet that goat cheese cheesecake would become the new state dessert, knocking the Key Lime Pie off it's lofty throne. Speaking of goat cheese: I miss it. When I first gave up milk fat I limited my 'give up' to cow's milk and began to enjoy goat milk products, sheep and milk products. After two years I saw I was beginning to adopt the same behaviors I had with cow's milk fat to goat milk fat and sheep milk fat - and give them up. 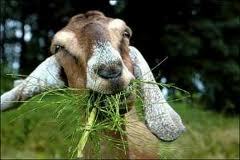 I do miss the sharp taste of a goat goat milk cheese occasionally. Back to more pressing matters: Twisted Goats Invading Florida continue to attack unsuspecting landscapers, cable repairmen and ball players. They usually attack in pairs. The first goat knocks them down and the second goat bites their way through the victims clothing and then chews on their socks. 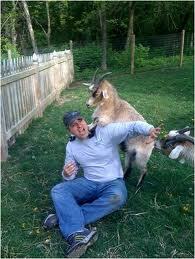 The goats do not seem to be attacking many women in the state and absolutely no moms have been attacked. It seems that Florida's moms have been keeping collections of unmatched socks in their homes for years. Moms around the state have simply been leaving a trail of mismatched socks outside their homes, leading a trail away from their abodes. The goats follow the trail where it leads them - usually to the thousands of gross smelling cigar bars - where they then proceed to attack the men in droves. 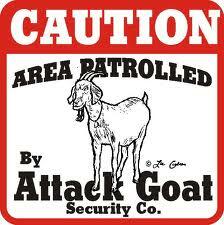 Hmmm, perhaps these invading goats might be put to good use? If you decide to visit our fair state in the future, of course you will be coming for the theme parks or the beaches. When you do , please take note of the new signs displayed as you enter those areas - and remember - you read it here first. I just left your fair state after two wonderful weeks in the sun! The warmth and sun really warm the heart of a Minnesotan! I was successful in avoiding goats entirely. Have a great weekend! They didn't attack until March. You got away just in time. Perhaps they will still be here when you return. Watch out under the cypress trees. Ha ha ha ha ha ha ha ha ha ha. What fun! Another reason to look forward to Fridays. 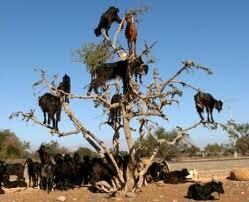 As a west coast Floridian I must admit I have not seen any twisted goats, but I will keep my eyes open from now on. At least I know what to do with all those single socks. my uncle raises goats in Indiana. but they stay nicely in their own acres. we have four down the road from us, but they stay in their yard. If we had a very big yard, in the country, we would have a couple to mow the grass. All my 'being attacked' problems have involved geese.